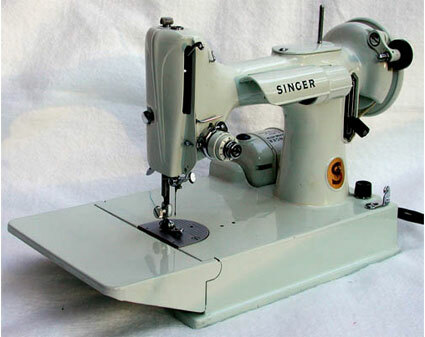 Pictured above and below are three of our Singer 221 Featherweight sewing machines. These machines are lightweight and they are a favorite of quilters. Their little case can be tossed (carefully placed) in the back of your PT Cruiser and off you go to a quilting bee or the AQS in Nashville or Paducah. 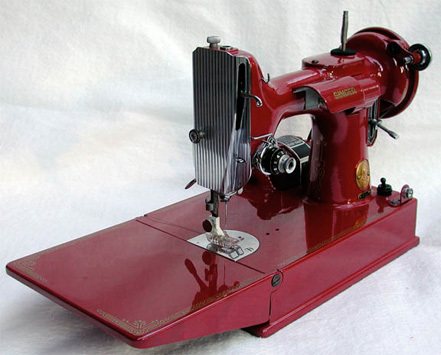 Even though they are straight stitch machines, they have a real cult following. A black featherweight in good condition with the case and accessories can be found for around $300-$450. Other colors and the model with a free arm can cost double that price. We have seen them sell on eBay for over $2,000.00. Fortunately we purchased our first Featherweight a number of years ago when they were cheaper. We wonder why the price of these little machines is so high since Singer must have made millions of them and there are many machines out there that cost a fraction of the cost and will do just as well. The earlier black featherweights have wonderfully engraved faceplates. The later version changed to a vertical stripe look as seen on the red Featherweight below. 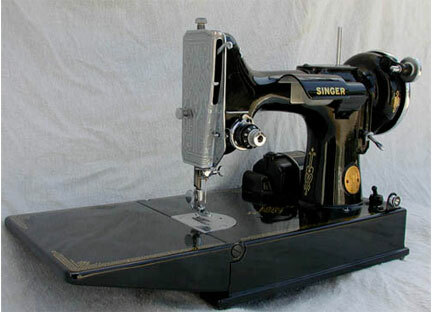 This black Featherweight has serial number AF 871 088 that according to Singer's web site is a 1941 model. There are a number of quilters and collectors of these things who want one of every color. The color of this featherweight stumped us for a while. Red? Did Singer make a red machine? A quick call to the Singer hotline for serial numbers solved the mystery. With serial number EH 892 110, this is a 1953 model. The nice person at the Singer Company mentioned that sometimes people repaint old machines with a deteriorated finish. Since we purchased it we have seen some remarkable machines done in blue and purple. How much does a red one cost? Lets just say it took a major bite out of Jim's old-age pension check. The machine appears to be Elizabeth's favorite, as it is the one she grabs as we head out the door on a trip where she will have some time to sew/play. It is also a great conversation piece. There really isn't much that can go wrong with Featherweights that a little oil, a new belt and new needle won't fix. It also helps to know which direction to thread the needle. The engraving on the faceplate is vertical stripes; when you see this you can assume the machine is a later model. However, there is nothing to say that the faceplate is original to the machine. The only good way to estimate the age of the machine is by using Singer web site information. Ya gotta admit it is kinda pretty. OK, so the machine looks somewhat greenish but they are referred to as the "white" Featherweight. The time of day the photo was taken shifted the color slightly. It is actually a pretty pearl color. It is not a white-white. The quilt batting the machine is sitting on is pure white. The original drive belts on these machines were also white. It is acceptable to replace a drive with a new belt but the white belt should be saved in case you want to either display or sell the machine. The machine has a gold-colored paper with a red "S" medallion. Pale turquoise Featherweights are quite different from the black and red ones seen above. White Featherweights are not nearly as fancy and the folding extension is much shorter. The machine is slightly lighter and quieter than a black model. These white machines are made in Great Britain. The serial number of this one is EV924169 indicating it was manufactured in 1964. We found it in Clarence, New York. 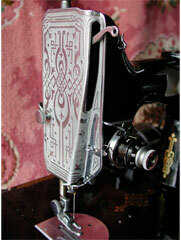 A number of attachments are available for Featherweights including buttonholers, zig-zaggers and walking feet. For sewing quilt patches together, this is all the machine one needs.